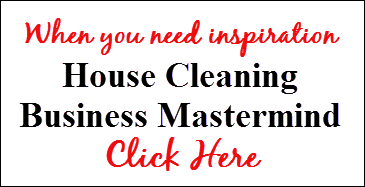 Are You Stressed with Your House Cleaning Business? On your road to a successful business, many issues can arise that need immediate attention. Many times these issues start creeping up because you didn’t take the time to properly research and plan your business. This series of special reports deal with specific issues in starting and running a home cleaning business. Sometimes, all it takes is a little tweak to make things right! This is a series of seven reports that cover different aspects of starting and running a house cleaning business. For speed cleaning and hiring/managing workers, click here. Is your business designed to attract the people in the area(s) you’re servicing? If not, it’s going to be almost impossible to get enough customers to stay in business. If you are extremely limited with your advertising budget, you’ll want to get this report just for the information I provide on using business cards. Getting your message out to attract new customers can be one of the biggest ways your business loses money. Discover what advertising works today in the house cleaning industry. 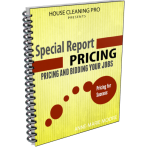 This is where you will learn how to make a profit cleaning houses by setting your rate correctly, knowing what motivates customers, and I take you step-by-step through the bidding process so you know how to do an estimate for house cleaning. By knowing exactly what your customers want, you can set a rate that will allow you to make a comfortable profit and grow your business. Anybody can sell themselves as a house cleaner, but it’s the businesses that use professional forms who get the best jobs – the ones that pay the most, allowing you to work in the nice homes in nice areas of your city. This report includes the script used by the House Cleaning Pro to land 98% of of the jobs bid using the right business forms. Cleaning for others is not the same as cleaning your own home and that’s even more true of the products and equipment you will need. 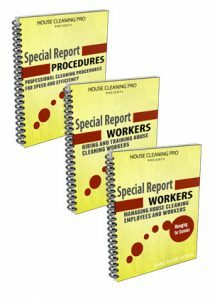 In this report you are introduced to all the products and equipment needed to perform a professional house cleaning. Are you spending money on the wrong products? Are you running into trouble using your client’s products and equipment? When you’re ready to grow your business, you’ll need to hire workers to do the cleaning for you. This is the only way you can increase your earnings. Doing all the cleaning yourself, you’re limited to the number of houses you can clean in a month. Do you need to know how to standardize and create processes in your business so you can hire workers? Then you might want to look into my House Cleaning Pro Business-in-a-Box to start and grow a cleaning business. There’s more to hiring and managing workers than you can ever imagine. Before you try and deal with all the issues, make sure you know what to expect and make sure you do it right the first time. Click the button to get started!